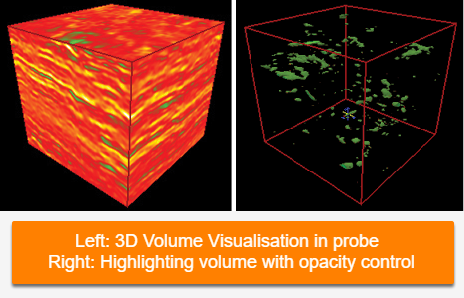 With the 3D Volume Visualisation feature, you can view an entire probe of 3D data using selective opacity to highlight particular amplitudes. As a prerequisite, you must create a probe (see Creating a Probe). In the 3D View, click the 3D tab on the left to configure the settings for Volume Visualisation. 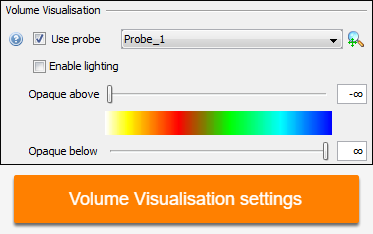 Use probe — Select this check box to visualise the volume in the 3D View within the selected probe. Zoom to view probe — Click the magnifying glass icon to make the screen’s center of rotation set to the probe. This allows you to orbit the 3D View around the probe. Enable lighting — Select this check box to add a shadowing effect. This check box is only enabled once you have selected the Use probe check box. Opaque above/Opaque below — Adjust the transparency of the colour bar (as a percentage of the class range) by moving the Opaque above and Opaque below sliders. Note: The colour bar changes according to the volume that is displayed in the 3D View. Tip: If you have a velocity volume loaded and defined in the survey (see Converting Time-Depth), 3D Volume Visualisation supports on-the-fly time/depth conversion.